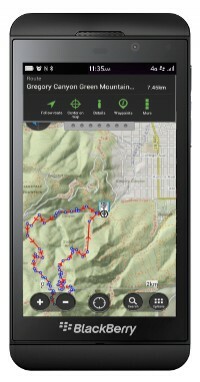 ViewRanger V4 has launched onto BlackBerry 10 smartphones. The free ViewRanger app is available to download from BlackBerry App World and helps you to plan, navigate, and share your walking, biking, and riding outdoor adventures. ViewRanger for BlackBerry 10 is ported from our popular Android version, and comes with free and unlimited access to a range of map layers including OpenStreetMap, OpenCycleMap, and aeriel imagery, that can be stored on your BlackBerry device for offline use. You can also search and download trail guides that the app will navigate along, many with detailed information and photos along the way. More than 400 brands have trail guides available to download alongside trail guides shared by ViewRanger users. Our free to use companion website MyViewranger.com allows route plotting, recorded GPS track analysis and map printing from a larger desktop screen. It is easy to synch route guides and recorded GPS tracks between the ViewRanger app and the MyViewranger website, and you can view, comment and ‘like’ the adventures of friends via the BlackBerry app. 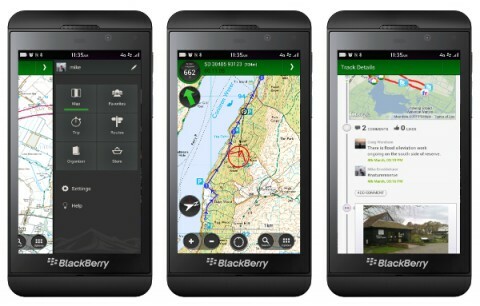 The app is free to download from BlackBerry App World immediately and comes with all of its functionality as well as free access to open source mapping and thousands of free trail guides. Once installed you can optionally purchase premium content such as national agency topographical mapping and premium trail guides via the ViewRanger website - and share your premium maps between your BlackBerry and any other device running ViewRanger.